Your apple pie doesn’t cut it, the Statue of Liberty is starting to slouch, and Superman can go screw. Finders Keepers — an unassuming new documentary from Bryan Carberry and Clay Tweel — is now standing head, shoulders, and left leg above the rest, claiming its rightful spot as the new ne plus ultra of America. Yep. That’s America right there, an easy-rolling hour and a half film about two men, both very real. One lost his leg and the other found it. Both believe it rightfully belongs to them and ergo: Finders Keepers. It’s been a good run for documentaries lately. The Act of Killing cracked our skulls open to co-mingle our grey matter with that of murderers. CitizenFour put us in the hotel room with Edward Snowden as he opened his box of secrets. Jodorowsky’s Dune, Art and Craft, and The Jinx all spun captivating tales of the weird, wonderful, and wriggly world. Finders Keepers may not be the best of this esteemed bunch, but it is superlative in its own right. It is superlatively American and enjoyable to a near addictive degree. Take the worst reality television show you’ve heard of, then imagine if it was made by artists. Take the poor schlubs who star in it, and let their souls shine through. Glimpse, if you will, the hidden truths of our nation, and do so with empathy and consideration. At the end of the day, all we want is a leg to stand on. Or another leg to stand on. Or perhaps just one that we can exhibit in our barbeque smoker. 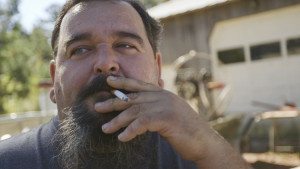 Finders Keepers tells the extremely strange and surprisingly true tale of Shannon Whisnant, a blue collar entrepreneur, flea market maven, and seeker of celebrity. 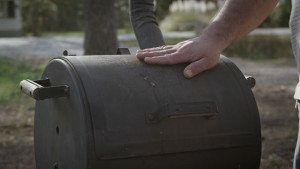 At a storage locker auction he purchases a smoker. Inside the smoker, he finds a leg. He then does what any of us would do; he tries to translate this appendage into a ticket to fame and fortune. Alas, someone else also feels an attachment to the limb. 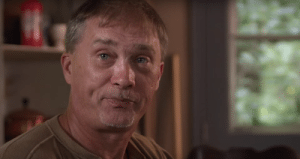 That person is John Wood, who grew the damn thing and then lost it twice — first in the airplane crash that killed his father and mutilated him, and then second when, addicted to pain killers and alcohol, he failed to pay his storage locker charges. It is a simple story as old as time. Man loses leg. Man finds leg. Men fight over body parts. Certainly reading about this scenario, it’s hard not to imagine it being told in a way that’s not sensationalized — as sensationalized as the media coverage was when this all went down, starting in 2007. That is not at all how Carberry and Tweel roll, though. They roll gently. With love. With bemused, curious affection and a non-judgmental attitude that’s near-saintly. Because these two guys — John Wood and Shannon Whisnant — they are just plus or minus one left leg crazier than any of you. The trick of any revealing documentary is in its ability to coax honesty from its subjects. In this, Finders Keepers excels. Wood and Whisnant hide nothing from us and, what’s more, talk to the camera as if the most natural thing in the world would be to agree with their points of view. In exchange, the film never mocks them, even when they’re fighting over an amputated, half-mummified human leg, which is for the entire film. One might wonder how a tale such as this could last for 84 minutes without dragging, or wandering far afield. It does so by taking a crazy story and using it as a lever to pry open something essentially, devastatingly, bizarrely American. It is a film about dreams, and second chances, and the odd routes one must sometimes take to make oneself whole. Finders Keepers is opening at the Roxie Theater on October 2nd. It will also be available on demand. 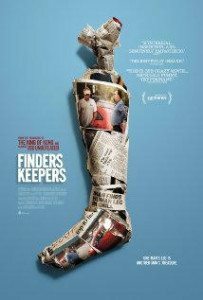 In my continuing efforts to watch, in a timely manner, all movies discussed on this site, I have just watched Finders Keepers. When it was over, I said, they should have just titled it: This is America. So, yes. I concur with your take on it. It’s one helluva story. I also read that, in 2016, Shannon Whisnant died. Making his part of the story sadder still. His time as the Foot Man really was his peak. Re-reading this piece, I remember just how good this film is. I am glad you also enjoyed it. I wonder if it is more or less “America” now than when I watched it? And poor Shannon. He never quite got pointed in the right direction.